This is a tale of woe for all you out there who have not kept up to date with Big Brother (Google) changes. Once upon a time, I had a good Google PageRank, and there was much rejoicing and I even boasted my good fortunes and considerable SEO skill in a post. So I asked the Friendly Folks of the Forum (lovely people, sort of like Hobbits of the Shire, but without the hairy feet) and they looked at my site and said Google probably didn’t like the links I was getting from other site’s footers, claiming that the site was created, maintained, hosted and/or powered by Get Business Online. And I pulled a few more hairs out (not a pretty sight, so no pictures). But giving up is not something I do, so I just submitted the site for reconsideration again and waited another 8 weeks. Nothing. NOTHING! Not even and email. By sheer coincidence, I noticed a message in Webmaster Tools, which I did not receive by email. I wondered about this and finally decided to check my Gmail spam box. Get this: emails from Google Webmaster Tools are considered spam by Google’s own email system. WHAT?! Anyway, I submitted a third reconsideration request, explaining everything I’d learned about possible reasons for penalties, why none of them applied to my site and how the email messages had gone missing, and I checked Webmaster Tools every day like a good boy. Within 2 weeks or so I was notified that my site had been checked manually and found to be compliant with Google’s quality guidelines. And there was much rejoicing again and now I can post and give hope to other wretched souls who may be tormented by penguins for no good reason. Brothers and Sisters, if you have lost your Google PageRank, read the guidelines, ask your peer network to review your site, fix anything that needs fixing and ask for your site to be reconsidered. It may take a while, but you will prevail! But if you think the woe is over, think again. If you search for “get business online”, it stands to reason that the top result will be a domain the matches the search query exactly, with a title and a heading that match the query exactly and a copyright notice that, you guessed it, contains a company name that matches the query. But no, Google thinks otherwise. 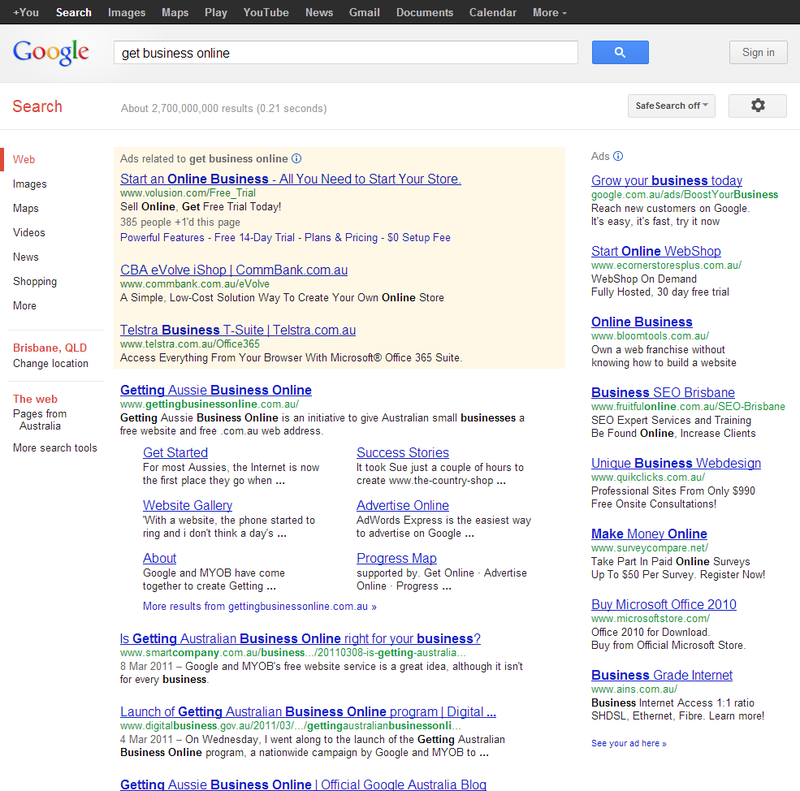 In fact, the top result is a site owned by … Google! It’s called “getting business online”, which, granted, is pretty close, but I don’t think that’s why it’s at the top of the list. Oh, no, I don’t, because it appears with full sitelinks, followed by yet another mention of the same bloody thing from MYOB, the other owner of the same site, and other mentions of the very same website on blogs and government sites. One of the blog posts is by Google itself, written by Claire Hatton, Google Australia’s Head of Local Business, and it’s a shocker! The images are not found, it’s stuffed with keywords and links and it violates so many of the quality guidelines it’s shameful. But I suppose Google can get away with it. Anyway, my site now has a Google PageRank of 4, which is nearly what it used to be, but at least it’s not 0 anymore. Phew. Have a great day and let me know if you need a hand with your SEO.